A used 2015 Honda Odyssey near Jackson MS provides stellar performance, safety upgrades, exterior styling, and a comfortable interior with new features and technologies. The Odyssey comes with powertrain, styling, interior, feature and safety equipment updates from the previous year. This minivan offers more than just versatile space. Enjoy the intelligent Multi-Information Display, which will communicate with all of your vehicle’s systems. The 8-inch screen displays incoming text messages and music information from Pandora and your USB Audio Interface. It will also show performance stats, like fuel consumption and trip range. Contact us for more information or swing by our showroom in Ridgeland, MS near Jackson. features that you and your family will enjoy. Whether you’re carrying people, cargo, or a combination of both, you’ll enjoy this extremely versatile vehicle. Odyssey EX, EX-L, Touring and Touring Elite models have intuitive touch panel controls that reduce button clutter on the center stack. An upper 8-inch display and a lower 7-inch display provide a simpler overall interface improves phone and audio, as well as navigation and audio. Jackson Honda drivers will enjoy listening to music, media, information on the HondaLink featuring Aha compatibility. This connectivity technology helps provide access to news and information, social media, personalized restaurant searches, Internet radio, audio books and more. Aha and Pandora interfaces are available on EX, EX-L, Touring and Touring Elite models. XM Radio is included in EX-L, Touring and Touring Elite models, as well as an HDD audio system on the EX-L.
Honda is committed to providing safety for all passengers. Crash protection is provided not only for the driver and passengers, but also for everyone else on the road. The Multi-Angle Rearview Camera with guidelines will make it easy to back into parking spaces carefully. The standard rearview camera also includes guidelines to help enhance visual accuracy. 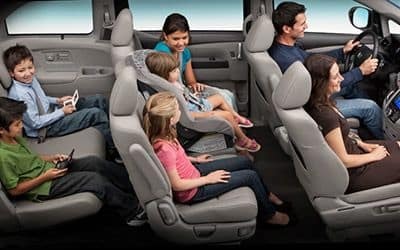 The Honda Odyssey uses Advanced Compatibility Engineering (ACE) body structure is a Honda-exclusive body design that enhances occupant protection and crash compatibility in frontal collisions. Anti-lock Braking System (ABS) uses a special modulator to pulse the brakes to help prevent wheel lockup. Also, Daytime Running Lights (DRL) enhances its visibility to other drivers by incorporating Daytime Running Lamps (DRL) up front. Schedule a test drive near Jackson MS.